Nancy Cowan’s life has been all about understanding animals and their relationships to Mankind. An accredited riding instructor as a teen, as a young mother living in New Hampshire, she became interested in sled dogs and the history of US exploration o f Antarctica by dogteam. Her conventional split in a conventional subdivision soon had the unconventional accessory of six huskies living in the backyard. Nancy became known around the globe for her writing about sled dogs as a sportswriter and author of seven self-published books. While running her own team and occasionally racing them, Nancy rediscovered an inner satisfaction she had known with her horses. 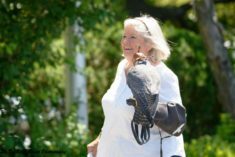 Halfway measures have never been enough for her, so when Jim, Nancy’s husband, began a quest to make falconry a legal hunting sport in the state, she became involved right away. Now, more than 30 years later, both Cowans are Master Falconers as well as owners of the internationally known New Hampshire School of Falconry. Life took an unexpected turn when Nancy and Jim were asked by wildlife experts and federal officials to take on the task of becoming licensed Wildlife Rehabilitators with a mission to rehabilitate and evaluate for release the State’s injured peregrine falcons. Through falconry, Nancy formed a connection with the wild peregrine, N Z,, not with the intention of taming him but rather to prepare him to return to live in the wild. This connection was so strong, so sweet, and so amazing, it changed Nancy far more than any change she had effected upon the raptor. Her book, Peregrine Spring, A Master Falconer’s Extraordinary Life with Birds of Prey, was written to bear witness to the surprising understandings she has learned from years of working with hawks and falcons, something Nancy teaches daily in her classes at her School. Ably agented by Jacqueline Flynn, her book was bought by Lyons Press, which released it in March of 2016. Parents of grown children and grandparents of two, Nancy and Jim Cowan reside in the small town of Deering, New Hampshire, where Nancy served 16 years as her town’s Town Clerk and Tax Collector. She and Jim are both now retired…or as retired as running a busy school can allow. They share their lives with five hawks, six falcons, and two Gordon Setter dogs.